Former U.S. 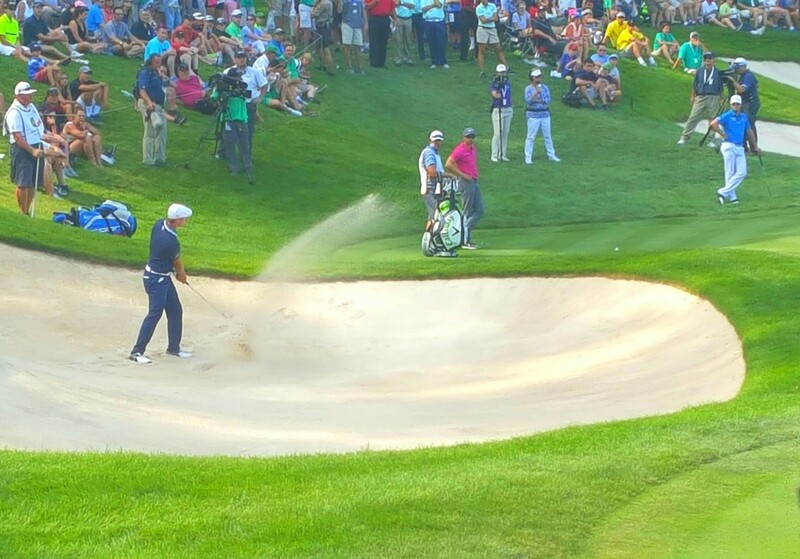 Amateur champ Bryson DeChambeau explodes from a green-side bunker at No. 18. 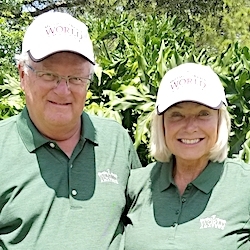 SILVIS, Ill. – If local players should shine at any PGA Tour event, it’d be at the John Deere Classic – the only annual stop on golf’s premier circuit in Illinois. Two are doing just fine through three rounds of this year’s $5.6 million tournament that concludes today. 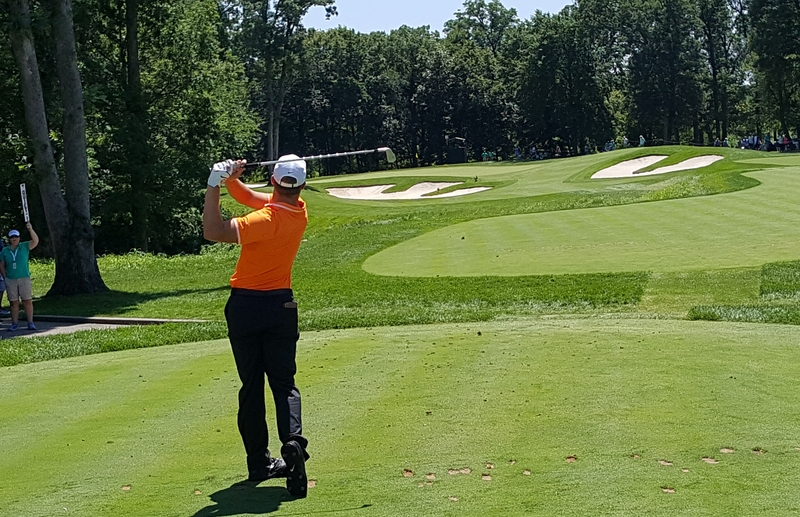 Whether either Wheaton’s Kevin Streelman or Northbrook’s Nick Hardy can catch 54-hole leader Patrick Rodgers in today’s final round is doubtful, but both have made their presence felt with 18 holes to go. Streelman, looking forward to a three-week break after playing four straight tournaments and 11 of the last 13, shot 67 on Saturday and is tied for 18th place – but he’s only two strokes out of a tie for sixth. Hardy, getting ready for his senior season at Illinois, is locked in a battle with Stanford’s Maverick McNealy, the winner of the 2017 Ben Hogan Award as the nation’s outstanding collegiate player, for low amateur. 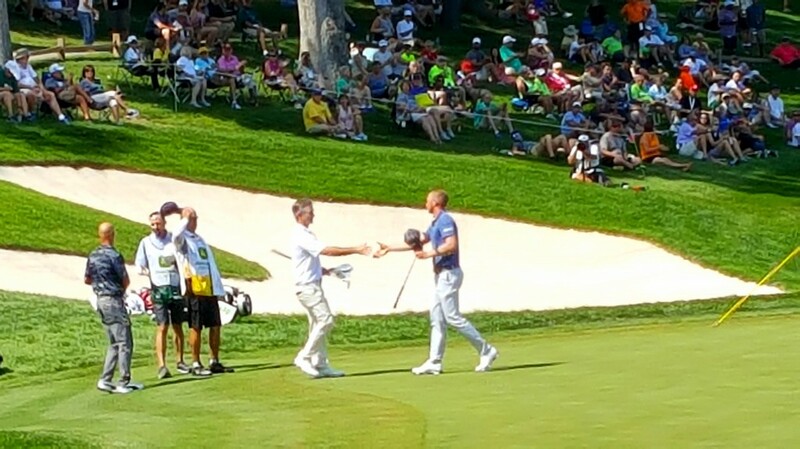 Kevin Streelman (lelft) congratulates Daniel Berger on his 63 — best third round at TPC Deere Run. The only two amateurs to survive the 36-hole cut, they played together Saturday and both shot 69. 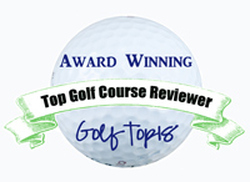 They finished the third round tied for 44th place playing against 80 touring professionals. Streelman has already won twice on the PGA Tour and he got a demonstration of what it might take to win on Saturday when playing partner Daniel Berger shot the day’s low round – a 7-under-par 63. Berger trails Rodger’s front-running 16-under-par 197 by two strokes and is tied for second with Scott Stallings. 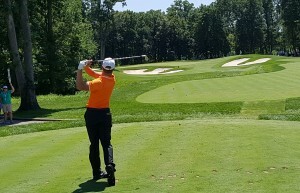 Illinois’ Nick Hardy is battling for low amateur honors. Though he didn’t play in either of the first two major championships and won’t be in next week’s British Open Streelman is on a solid stretch of play. He had four straight top-20 finishes before a tie for 29th last week in the Greenbrier Classic and a good finish today could propel Streelman high up the leaderboard. He feels a change in scheduling has worked out “perfect.’’ Streelman decided to skip sectional qualifying for the U.S. Open, which meant two weeks off before his productive four-tournament stretch. After the PGA, the year’s final major, comes the FedEx Playoffs – and that’s where the biggest paydays are available. A big payday awaits whoever wins the JDC today. The champion gets the biggest check in tournament history — $1,008,000. Rodgers, 25, had a brilliant amateur career but has yet to win on the PGA Tour. He has happy memories at TPC Deere Run, however, and would be a fitting champion. 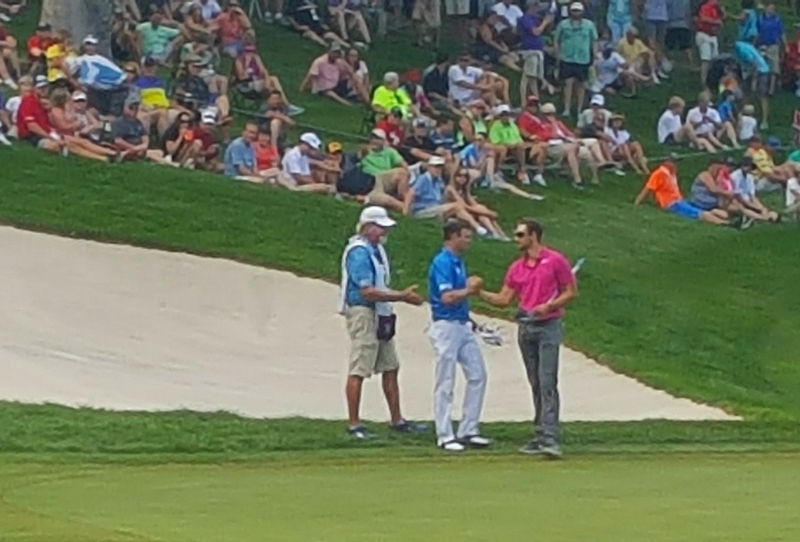 Patrick Rodgers (right), being congratulated by Zach Johnson, holds a two-stroke lead. Tournament director Clare Peterson gave him a sponsor’s exemption in both 2012 and 2013, and he tied for 15th in his second appearance after leading briefly in the third round. Johnson, who won the JDC title in 2012, still has hopes of winning this one, however. He’s in a 10-way tie for eighth place, five shots behind Rodgers, who has made 150 feet of putts the last two days and 19 birdies in the first 54 holes. Rodgers, who grew up in Avon, Ind., before going to Stanford, would also become eligible for next week’s British Open if he wins today. Since the JDC moved to TPC Deere Run in 2000 the third round leader has gone on to win nine times, including the last three years when Brian Harman, Jordan Spieth and Ryan Moore were the champions. 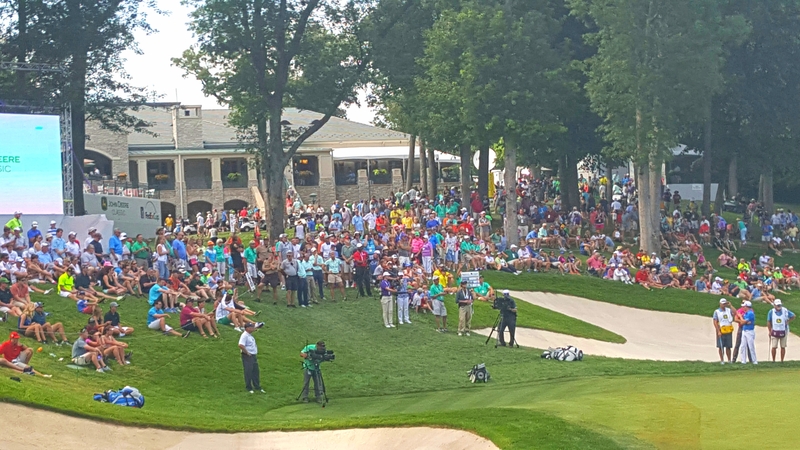 The crowd was big and enthusiastic during the JDC’s third round at TPC Deere Run.